Block definitions describe how a block looks and behaves, including the text, the colour, the shape, and what other blocks it can connect to. Once the custom blocks are defined, each platform loads these definitions in different ways, detailed in web and Android specific configuration guides. The init function creates the block's shape. In the context of this function the keyword this is the actual block being created. Both examples load the same 'string_length' block. // Assign 'this' to a variable for use in the tooltip closure below. The primary colour of a block is defined by the JSON colour property, the block.setColour(..) function, or by using themes and defining a block style. See the block colour guide for more details. Users can create sequences of blocks using the nextStatement and previousStatement connectors. In Blockly's standard layout, these connections are on the top and the bottom, with the blocks stacked vertically. A block with a previous connector cannot have an output connector, and vice versa. The term statement block refers to a block with no value output. A statement block will usually have both a previous connection and a next connection. nextStatement and previousStatement connections can be typed, but this feature is not utilized by standard blocks. Creates a point at the bottom of the block, so that other statements can be stacked below it. A block with a next connection but no previous connection usually represents an event, and can be configured to render with a hat. Creates a notch at the top of the block, so that it can be connected as a stack of statements. Blocks with a previous connection cannot have an output connection. A block may have a single output, represented as a male jigsaw connector on the leading edge. Outputs connect to value inputs. Blocks with an output are usually called value blocks. Blocks with an output connector cannot also have a previous statement notch. Value input: Connects to a output connection of a value block. A math_arithmetic block (addition, subtraction) is an example of a block with two value inputs. Statement input: Connects to a previous connection of a statement block. The nested section of a while loop is an example of a statement input. Dummy input: Does not have a block connection. Acts like a newline when the block is configured to use external value inputs. JSON defined blocks are structured as a sequence of interpolated message strings ( message0, message1, ...), where each interpolation token (%1, %2, ...) is a field or an input end (thus where the input connector renders, within the message) in the matching JSON argsN array. This format is intended to make internationalization easy. The interpolation tokens must match the args0 array completely: no duplicates, no omissions. Tokens may be present in any order, which allows different languages to change the layout of the block. Text on either side of an interpolation token is whitespace-trimmed. Text using the character % (e.g. when referring to a percentage) should use %% so that it is not interpreted as an interpolation token. Blockly automatically changed the order of the fields, created a dummy input, and switched from external to internal inputs. An alt object may have its own alt object, thus allowing for chaining. Ultimately, if Blockly cannot create an object in the args0 array (after attempting any alt objects) then that object is simply skipped. A dummy input will be automatically added to the end of the block if the message string ends with text or fields that are not contained by an input. Thus if the last input on a block is a dummy input then it may be omitted from the args array and it does not need interpolation into message. The automatic addition of a tailing dummy input allows translators to change message without needing to modify the rest of the JSON. See the example of "set %1 to %2" (no dummy input) and "put %2 in %1" (dummy input added) earlier on this page. In rare cases the automatically created trailing dummy input needs to be aligned to the "RIGHT" or "CENTRE". The default if not specified is "LEFT". In the example below message0 is "send email to %1 subject %2 secure %3" and Blockly automatically adds a dummy input for the third row. Setting lastDummyAlign0 to "RIGHT" forces this row to be right aligned. When designing blocks for RTL (Arabic and Hebrew), left and right are reversed. Thus "RIGHT" would align fields to the left. Any number of message, args, and lastDummyAlign properties may be defined in the JSON format, starting with 0 and incrementing sequentially. Note that the Block Factory is not capable of splitting messages into multiple parts, but doing so manually is straightforward. Each method can take an identifier string, used by code generators. Dummy inputs rarely need referencing and the identifier is usually left unset. As seen above, each method returns the input object for configuration through method chaining. There are three functions that are used for configuring inputs. This optional function is used for type-checking of connected inputs. If given an argument of null, the default, then this input may be connected to any block. See Type Checks for details. This optional function is used to align the fields (see below). There are three self-descriptive values which may be passed as an argument to this function: Blockly.ALIGN_LEFT, Blockly.ALIGN_RIGHT, and Blockly.ALIGN_CENTRE. Note the British spelling of 'centre'. Left alignment is the default. When designing blocks for RTL (Arabic and Hebrew), left and right are reversed. Thus Blockly.ALIGN_RIGHT would align fields to the left. Once an input has been created and appended to a block with appendInput, one may optionally append any number of fields to the input. These fields are often used as labels to describe what each input is for. The simplest field element is text. Blockly's convention is to use all lowercase text, with the exception of proper names (e.g. Google, SQL). An input row can contain any number of field elements. Multiple appendField calls may be chained together to efficiently add several fields to the same input row. The appendField('hello') call is actually a shortcut for using an explicit FieldLabel constructor: appendField(new Blockly.FieldLabel('hello')). The only time one would wish to use the constructor is when specifying a class name so that the text may be styled using a CSS rule. Block inputs can render as either external or internal. The block definition can specify an optional boolean controlling whether inputs are inline or not. If false then any value inputs will be external (such as the left block). If true then any value inputs will be inline (such as the right block above). If not defined then Blockly will use some heuristics to guess which mode is best. Assuming Blockly makes the right choice, leaving this field undefined is preferable since different language translations can automatically have different modes. See the JSON example of "set %1 to %2" (external inputs) and "put %2 in %1" (inline inputs) earlier on this page. Use inline inputs when a block is likely to have small inputs such as numbers. The user can toggle this option through the context menu, if the collapse configuration is enabled (defaults to true if the toolbox has categories). Fields define the UI elements within a block. These include the string labels, images, and inputs for literal data such as strings and numbers. The simplest example is the math_number block, either a field_input (web) or field_number (Android) to type a number. Most fields have a name string used to reference them during code generation. Label strings provide context to the other fields and inputs. They are so common and intrinsic to translation, they have their own notation. Any message text between interpolation arguments becomes label strings. Alternatively, labels may be interpolated explicitly, either as an object or as text. appendField accepts both FieldLabel and, more commonly, strings to create labels. When added explicitly, authors can include a CSS style name to customize the view on Blockly for Web. Like labels, images are usually static indicators instead of input fields. The FieldImage object is created with the image URL and the desired height and width. The image will be scaled to within the specified dimensions, while preserving the aspect ratio. The block will expand as needed to accommodate the image. An optional fourth argument specifies the alternate text for use when the block is collapsed. The image URL can be relative. On web, relative URLs are resolved relative to hosting page's URL. On Android, the relative URL is treated as an asset path. On iOS, a relative URL must be a simple file name (no path) and will be resolved as a file in the application bundle. Text input allows the user to input text. The items list of the drop-down field is specified by a list of two-part lists. The first item of each inner list is the human readable name; the second is the item identifier string. In Blockly for Web, if all of the human readable strings share the some prefix or suffix, those strings will extracted as a label before or after the drop down. This allows the prefix/suffix label place to adapt to language conventions. Note: See Drop-Down Menus for more info. A checkbox field provides a boolean input. Optionally, the FieldCheckbox constructor can also take a second argument which becomes the validation function or change handler. 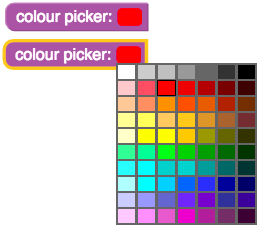 The colour picker allows the user to select from a set of opaque colours provided by the programmer. Use any CSS-compatible format for the list of colours, including #f00, #ff0000, or rgb(255, 0, 0). Another field element is a variable selection menu. The field defines the default variable name to use (in this case 'x'). If this name is omitted, the variable will be a new unique variable (e.g. 'i', 'j', 'k' ...). Number fields provide number input and validation. In mobile environments, unlike normal text inputs, this can bring up a number pad for the on-screen keyboard. Using additional parameters, numeric input can be constrained in a number of ways. The range can be constrained by min and max values. Setting precision (usually a power of 10) enforces a minimum step between values. That is, the user's value will rounded to the closest multiple of precision. The least significant digit place is inferred from the precision. Integers values can be enforces by choosing an integer precision. Some combinations of constraints are invalid, and should be avoided. For example, a range of 1 to 4 with a precision of 5 has no valid values. Angle fields present a UI to graphically select an angle. By default, this is from 0° (inclusive) to 360° (exclusive) counter-clockwise, with 0° to the right, and 90° to the top. Out of bound values are wrapped onto this scale. Any angle (even fractional) can be entered with the keyboard, but angles selected with the mouse are rounded to 15°. In the web version, the range and mapping of number to represented angle can be customized via the constants in field_angle.js. Such customizations should be identical on all versions of Blockly that share saved workspaces. 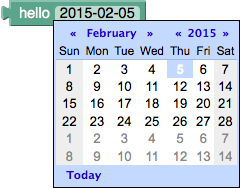 The FieldDate presents a calendar date. It is initialized with a specific date, or today's date if no date is specified. Note that due to its limited use and large footprint, FieldDate is not compiled into Blockly by default. Add goog.require('Blockly.FieldDate') to your project to enable it. Tooltips offer instant help when the user hovers their mouse over the block. If the text is long, it will wrap automatically. Blocks can have a help page associated with them. This is available to the users of Blockly for Web by right-clicking the block and selecting "Help" from the context menu. If this value is null then the menu will be greyed out. Blocks can have change listener functions that are called on any change to the workspace (including those unrelated to the block). These are primarily used to set the block's warning text, or similar user notification outside the workspace. The function is added by calling setOnChange with a function and can be done during init or via a JSON extension if you plan to use it on all platforms. The system calls the function, passing in the change event. Inside the function, this refers to the block instance. Because the function is called on any change, if used, developers should ensure the listener runs quickly. One should also be wary of changes to the workspace that might cascade or loop back to the listener. See the controls_flow_statements, logic_compare, and procedures_ifreturn blocks for examples. Note that editable fields have their own event listeners for input validation and causing side effects. Mutators allow advanced blocks to change shape, most notably as a result of users opening a dialog to add, remove, or rearrange components. Mutators may be added through JSON with the mutator key. Note: Find out more on Creating Mutators. Block instances have a number of properties that configure how they behave to the user. These can be used to constrain the workspace to reflect certain properties of the domain (e.g., there is exactly one 'start' event), or focus the user's effort (e.g., a tutorial). By default, the user can delete any block on an editable workspace (not readOnly). Sometimes it is useful to make certain blocks permanent fixtures. For example, tutorial skeleton code. When set to false, the user will not be able to change the block's fields (e.g. dropdowns and text inputs). Blocks default to editable on an editable workspace. When set to false, the user will not be able to move the block directly. An immovable block that is a child of another block may not be disconnected from that block, though it will move with its parent if the parent is moved. Blocks default to movable on an editable workspace. Data is an optional and arbitrary string that is attached to the block. When saved as XML the data string is stored in a <data></data> tag so that it may be round-tripped back to a block. Use the data string to associate a block with an external resource or for any other custom purpose. Note that if a block is duplicated or copy/pasted the data string is also duplicated. Undeletable blocks cannot be duplicated or copy/pasted.